My name is Jackie and I want to share a part of my life-changing journey. Last year, after feeling unwell for a period of time, I decided to start my fitness journey to help “me” feel better about myself and realized that the journey could only be completed by me. In Sept 2017 I joined the gym. In February, a group of staff from Harvey’s Oil decided to take part in “Row for Heart” fundraiser for Cardiac Care in St. John’s. I found my passion. I decided in May that I really wanted to reach out and try to get on a team for the Royal St. John’s Regatta. I was successful in joining a team of beginners. These ladies had it all together. The team was assembled, a coxswain was secured and off I went. These ladies are nothing short of amazing. the support and enthusiasm is uplifting. I have not only gained skill for rowing but have made friends for life and my self-confidence is coming back. 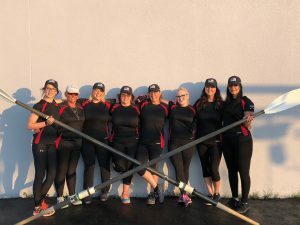 On August 1, 2018 at the Royal St. John’s Regatta, I will row for the first time as a member of the crew “ Harvey’s Home Heating”. What a journey this year has been for Me!